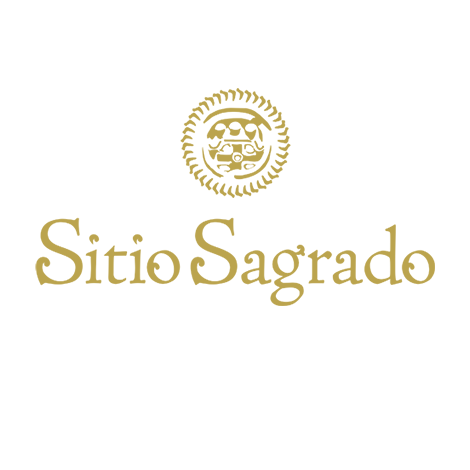 Photo by: Carla Carrasco O.
Immersed in ancient mysticism and located near the historic town of Tepoztlan, Sitio Sagrado is a haven for the senses; inviting you to renew your spirit and the romance in your soul, while inspiring indulgence in the simple pleasures of life. The 23 spacious suites decorated in soothing earth tone hues feature private terraces - many of which boast magnificent panoramic views. These suites are situated on the perimeter of an inviting central area complete with a heated pool, decadent daybeds, bar service and snacks. 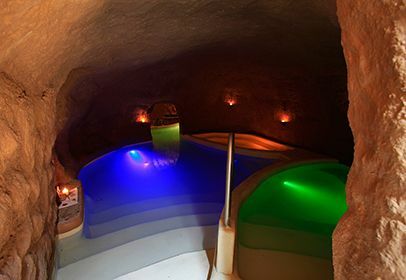 The hydro-spa located in an area of over 2000 square meters of picturesque terrain, is a tribute to the planet and the essential elements of life. Experience a unique journey through time in “The Cave of Senses" with treatments in cenotes, including exfoliation and aromatherapy combined with multimedia audio, video and special effects to further stimulate the senses. 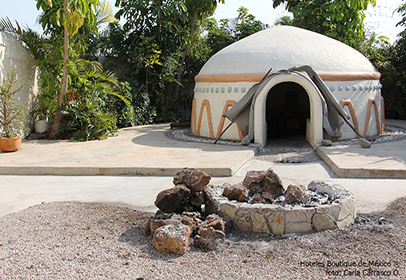 To sample the unique, a prehispanic temazcal offers a spiritual ceremonial experience. 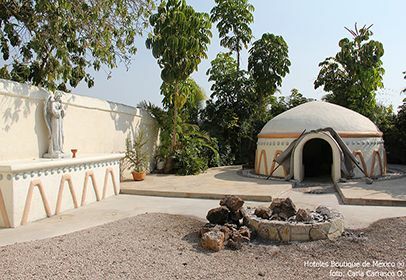 Distinctive treatment options include the Eternal Love Ceremony complete with a couples massage, live Egyptian harp music and other surprises. 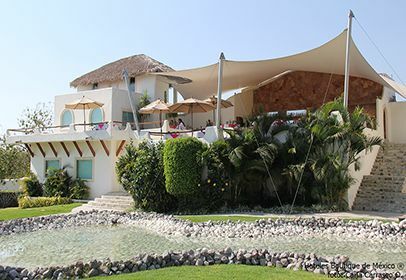 The restaurant boasts idyllic views of the area and offers a fusion of fine French and Mexican cuisine. 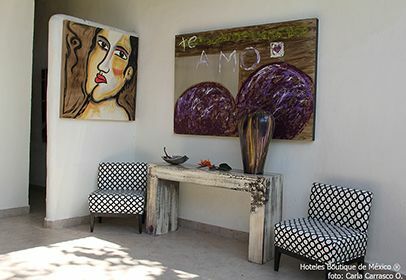 The chef´s unique dishes are prepared with organic ingredients and quality products. 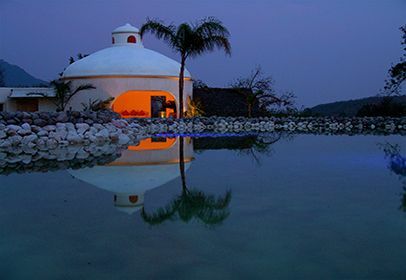 Experience exquisite days of relaxation that effortlessly blend into magical and romantic nights at this divine sanctuary of wellness. Mixing a few nights in Mexico City with a getaway to Tepoztlan makes for an interesting holiday. 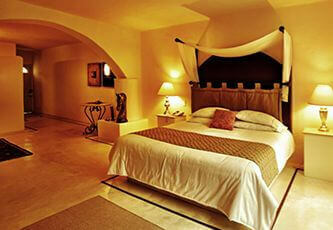 At less than an hour away, they are truly worlds apart and allow you to experience Mexico, old and new. The signature Spa treatments. 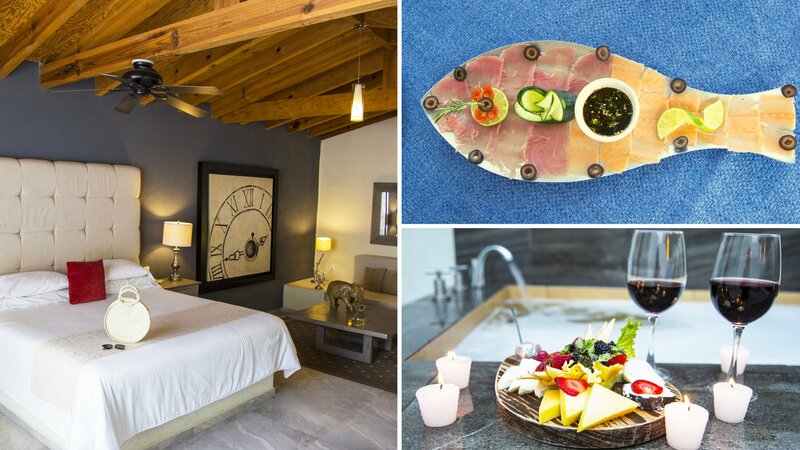 Honorable mention goes to the Amor Eterno experience with its en suite couples´ massage accompanied by live music. Temperatures can vary over 10 degrees between Mexico City and Tepoztlan, making it a fantastic place to visit when things get chilly in the big city. 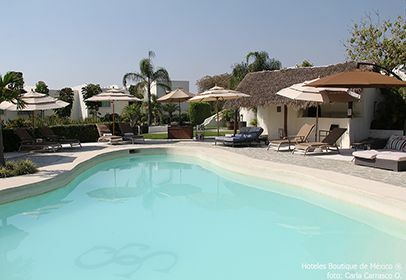 Sunshine, quiet and a heated pool make for an enticing getaway. The privacy, the unobtrusive service and the air of tranquility that only a Spa hotel can convey. Spa lovers for sure. Especially those that like to try something new. 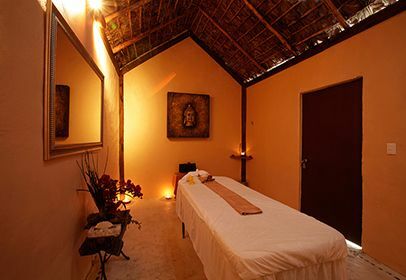 Tepoztlan is known as a mystical area of this country and therapists have particularly soothing hands. All accommodations are more than 750 sq feet in size. Most have a private outdoor terrace and a hydrobath. All feature LCD flat screen tvs, organic bath amenities. King bed and sofa that can be converted into a single. 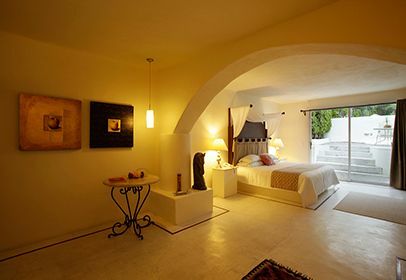 King bed, single sofa bed, small sitting area, with tub and private patio. 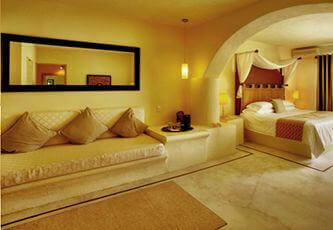 King bed, single sofa bed, with tub, and private patio. 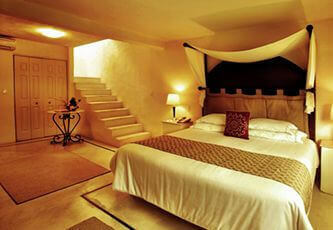 King bed, large rooftop deck with private heated plunge pool, indoor Jacuzzi, living area. Cancellations received 2 or more days prior to arrival date will not have a penalty charge. 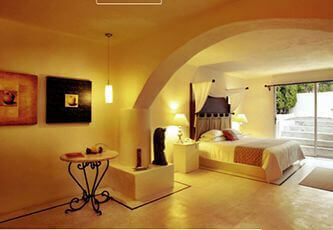 Cancellations received one day prior to arrival day will be penalized with the complete stay. Extra guest: $85 USD Children over 13 years old are welcomed. The hotel can arrange transportation from the airport to the hotel. Estimated time one hour and 15 minute. In a surface of more than 2,000 sq. 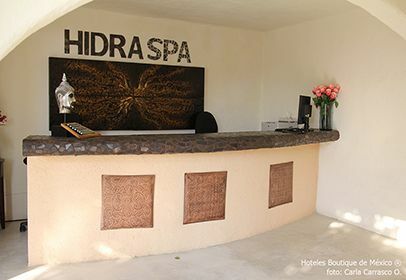 meters, Hidra-SPA is a tribute to our planet and the elements of the nature that create life. It has a private pool, steam area, showers, bathrooms, dressing room, sitting area separate men & woman. Based to stimulated the senses. The changes of temperature and the aromatheraphy improves the relaxation of the body and mind. Including the Thalassotherapy (Seawater and salts). Delicious and relaxing beverages, multi-media, audio, video, special effects, lasers, and music. This unique experience is the distinctive activity of the place. Enjoy and let go on a journey through time. Scrub body treatment and aromatic chocolate wrap which generates a great moisturization and smoothness to the skin releasing endorphins that envelop the user in a state of absolute relaxation. Massage with quartz and hot stones designed to generate an energetic alignment between body, mind and spirit. Day and night, from your suite terrace, enjoy an exfoliation with marine salts, aromatherapy and a head massage in the tub. On the thalasso spa deck you will have a special set up with candles, incense, music, relaxing masagge. In terrace, ceremony of union, love elixir, couples massage and live music with Egyptian harp. Relaxing massage executed by 2 therapist simultaneously. 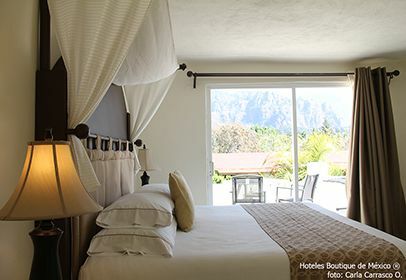 Located on an upper floor deck and boasts spectacular views of the surrounding mountains, the hotel´s garden and, in the evenings, the star-covered sky. The menu—a fusion of French and Mexican cuisines—was designed by noted chef Frederic Lejeune and is casual, tasty and fresh. 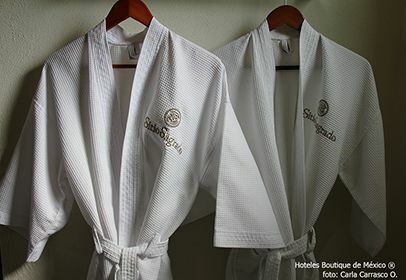 The hotel´s full menu is also available for room service and this is a popular option as most guests choose the hotel for its romantic appeal. Select premium cocktails and accompanying snacks can be ordered pool-side during the day. BARS: There are two bars at the hotel. One is located in the main restaurant and the other is pool-side.